Involved in aeromedical retrieval since 1997, and with this service since 1999. I have also worked in Prehospital and retrieval medicine in Queensland and the Northern Territory, and with London HEMS, and have held management and training positions in NSW and Qld. 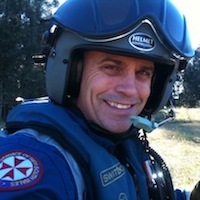 I am a senior lecturer with James Cook University (QLD) with the Postgraduate Certificate in Aeromedical Retrieval. I am the current chair of the Australasian College for Emergency Medicine Committee in PreHospital and Retrieval Medicine, and have authored several book chapters on aeromedical retrieval. In my spare time I like moonlit walks on the beach, playing love songs on my guitar, and flying in my private plane. I have a passion for PreHospital trauma care, having trained in both Australia (NSW and Qld) and the UK (with London HEMS, Kent/Surrey/Sussex, Essex and Herts, and East Anglia HEMS organisations). I have an interest in Trauma Anaesthesia, Ultrasound guided Regional Anaesthesia, and Neurosurgical and Vascular Anaesthesia. I am a PreHospital Care Faculty member with the Royal College of Surgeons, Edinburgh. I also have a strong interest in medical education. I have been involved in overseas humanitarian deployments and regularly lecture at International Conferences about PreHospital Trauma Care. I have worked for GSA HEMS since 2008, and was employed in NSW Ambulance as an Ambulance Officer prior to commencing medical school. In my spare time, I enjoy photography, travelling, creating mischief with my two awesome kids, and providing 8% of the humorous cat videos found on the internet. Lee is an emergency physician with interests in EMS & medical education. Lee completed his ED training at Harbor-UCLA in Los Angeles in 1998 & a fellowship in aeromedical retrieval in Sydney in 2002. Lee’s career has spanned four continents & has included stints as the EMS director for Hawaii, EP with one of four USAF Mobile Flying Surgical Team (MFST) in Europe & volunteer work in Asia & the Americas. He currently works in the EDs of St George Hospital in Sydney, Wollongong Hospital in the Illawarra Region of NSW & as a Senior Retrieval Specialist with GSA-HEMS since 2007. Lee’s also cofounder of DevelopingEM, a not-for-profit organisation that provides education in prehospital & critical care medicine to under-resourced regions of the developing world. Although Lee was born & raised in the US he’s neither a fan of fast food, baseball or apple pies. He enjoys cameo appearances in indie films, running on the beach with his dog Buddy & chilling with his wife Rebecca & their soon-to-be Finebaby. A/Prof. 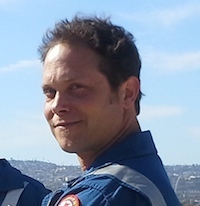 Brian Burns MB BCh BAO BMedSci MSc DipSEM FRCSEd FACEM, Emergency Physician, (Northern Beaches Hospital and Royal North Shore Hospitals), Retrieval Specialist & Director of Research, Greater Sydney Area HEMS, Trauma Director, Orange Health Service, NSW. Originally from Dublin, Ireland. Graduated from University College Dublin in 1998. EM specialty training at St.Vincent’s Hospital, Sydney. Has been a consultant with GSA-HEMS for 5 years. Previously worked for 5 years as an emergency physician at Liverpool Hospital before moving to the Northern Beaches of Sydney. Advocate of #FOAMEd. Detests mediocrity. Interests include critical care, trauma, shock, resuscitation and ECMO. Researcher in prehospital care, trauma and critical care. To alleviate constant musings likes to relax by trail running, mountain biking, surfing, kayaking etc. Enjoys a good rant with similarly minded friends (e.g. Cliff Reid) over a glass of pinot noir. I don’t own a private plane but know someone who does (Neil). At home my main role is to put the movie Frozen on. 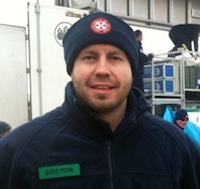 Dr Fergal McCourt MB BCh BAO BMedSci MSc FACEM, Senior Retrieval Specialist, Greater Sydney Area HEMS, NSW. Emergency Physician, Orange Health Service and VMO Northern Beaches Hospital. Also a University College Dublin Graduate, moved to Sydney to be closer to the sun and undertake emergency medicine training at Royal Prince Alfred Hospital, Sydney. After a transport fellowship in Canada, returned to Australia to ride motorbikes, fly in helicopters and paddle surf-skis around the bull shark infested waters of Sydney Harbour. Dr Clare Richmond MBBS B Med Sci FACEM Dip IMC Retrieval Specialist, Director of Emergency Medicine Training – Sydney HEMS, State Retrieval Consultant, NSW Ambulance. Emergency Physician VMO Royal Prince Alfred and Canterbury Hospitals. Graduated from Sydney University, trained in Emergency Medicine at Royal Prince Alfred Hospital. She completed a fellowship Sydney Clinical Skills and Simulation Centre and maintains a strong interest in medical education. She has trained in PHARM in Sydney, Alice Springs and London. Clare undertook yoga teacher training to consider her alternative career path and hangs out with her dog, Archie in the park at every chance she can. Wow, Geoff I have found you!!! On the 24th of March 2012 you and your crew saved my husband’s life in Banstead, Surrey, UK. Nigel was cycling down our road when a car turned in to his path leaving him in a critical condition. If it wasn’t for your speed and skills Nigel’s outcome could have been so very different. He sustained fractures to his face and the base of his skull, broken pelvis, shattered elbow, breaks to both legs, including an open fracture and brain damage. Nigel has made a fantastic recovery although he has been left with life changing injuries. I can’t thank you enough for what you did for him – thank you feels so inadequate for saving his life. I wish you weren’t so far away, I’d love for you to meet him, to show off your good work. If you Google Nigel Barclay you will find more info on him, KSS did a piece on his story. At the end of May I will be abseiling Spinnaker Tower in Portsmouth to raise money for KSS. I’m thrilled to have found you and to have the chance to thank you from the bottom of my heart for giving me back my husband. Thank you Geoff. Is this an all Dr service? There are only Drs and no nurses listed here on your team. Doctors and paramedics on the helicopters and road ambulances. Our HEMS doctors also work with flight nurses for fixed wing retrieval. I am a flight nurse /Paramedic with University Air Care (HEMS) in Cincinnati, Ohio, USA… had the opportunity to meet Dr. Brian Burns recently… albeit briefly! I am also a military flight nurse, and have an operational question regarding uniforms. The US Air Force is using 2 piece flight suits for crews deploying down range, while we in the civilian world still use the standard 1 piece nomex flight suits. Question is: What is your uniform complement comprised of? Flight Helmet for all crew, or an Ops-Cor type… ( type worn by special operations), or headset… Appreciate any insight you may be able to share!